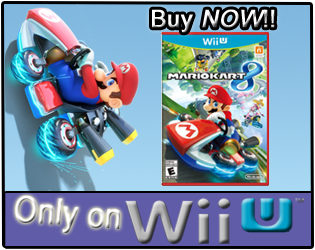 The Wii U released on November 18, 2012, just over 4 months ago now in the United States. As you may well know, the Wii U system released in two sets: the Deluxe Set with a MSRP of $349.99 and the Basic Set with a MSRP of $299.99. Sony has already made the official announcement about the PlayStation 4, and while we don't know a price point on it yet, you can already sign up on Amazon.com and at GameStop stores to be notified when they get more information. Microsoft is supposed to be revealing information about their next console (Xbox, Durango?) soon, and we don't what the price(s) on that new system will be either. You may own a Wii U and sometimes wonder what the current trade-in value is for it. If you're thinking about trading in the Wii U now and putting the amount you get from it toward a new system, how much can you currently get for your Wii U system? Brew yourself some coffee, and let's take a look at the current trade-in values for the Wii U Deluxe Set and Wii U Basic Set! FPS Saturday! Black Ops II Wii U multiplayer match. Last week, in the "FPS Friday!" post, I wrote about one reason I find Call of Duty's multiplayer addicting. I said, "...one big reason I often find myself staying for 'just one more battle', is how close some of the battles are." The video below is of a Black Ops II multiplayer match, on the Raid map. You can see how my team was behind basically the entire match. We were losing by 17 points at one moment in the match , 17 points, but we kept on battling. I have never been a fan of quitting games, just because I'm losing. As a matter of fact, I can't remember the last time I quit a match just because I (or, we) were getting dominated by the other team. This video, with last week's video, I think shows some good reasons why you should never quit in the middle of a multiplayer match if you're losing, whether that's in Call of Duty: Black Ops II or any other FPS game. Also, if you aren't aware of it, Black Ops II on the Wii U (not sure about the other versions) is currently have a Double XP weekend in the Multi-Team mode. I haven't tried it out just yet, but I did play some regular Team Deathmatch battles last night. 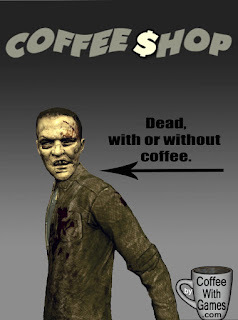 If you own a Wii U and have been playing Black Ops II my Nintendo Network ID is Coffees. Do you ever quit in the middle of a multiplayer match, just because you're losing and it doesn't look like your chances of winning are very good? Or, do you stick it out and hope for the best, even if the best doesn't look like it will be a "win" at the end? 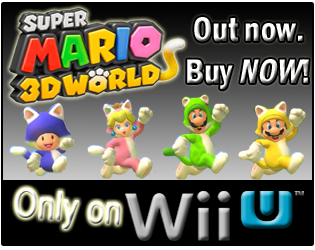 WiiWare Wednesday! Castlevania: The Adventure ReBirth - Hours spent in Transylvania? Call of Duty: Black Ops II's online multiplayer is addictive. I often find myself thinking that I'll hop on and play one or two matches, then play something else. It ends up though, that I find myself still playing Team Deathmatch battles in Black Ops II an hour (or two, or three) later. What do I find so addicting about Call of Duty's online multiplayer? Well, there are a number of things, but one big reason I often find myself staying for "just one more battle", is how close some of the battles are. Sure, there are occasional blowout battles, where one team is completely dominating the other, but it's the battles that are close and down to the last second, that I really enjoy. Below, you will see a Black Ops II match where my team lost the lead with just over 2 minutes remaining, but we kept on fighting. I think the video shows how battles in Call of Duty: Black Ops II can be really close, with every second counting, and why the multiplayer is so addicting. I played the match above on just the Wii U's GamePad, like the majority of my Black Ops II matches. As for my primary weapon in the video, it was the Mk 48 with the Full Metal Jacket (FMJ) and Target Finder attachments. My tactical weapon was the Shock Charge. It is what I was throwing at the very end of the match to help me stun the enemies in the building, which I was able to clear out with my teammate's help, giving us the win. Like always, feel free to add my Nintendo Network ID, Coffees, to your Wii U friend list, and if you have Black Ops II, perhaps I'll see you online! Have any of you been playing Black Ops II recently on the Wii U (or, other console)? Or, have you perhaps been playing other FPS games, such as the recently released Crysis 3? WiiWare Wednesday! Mega Man 9 - How many hours have U.S. Wii owners reported playing? February was a busy month, but I found my time dominated by one game in particular. I mentioned in last month's "January Brewed" post, that I like the idea, "If you fail to plan, you plan to fail. 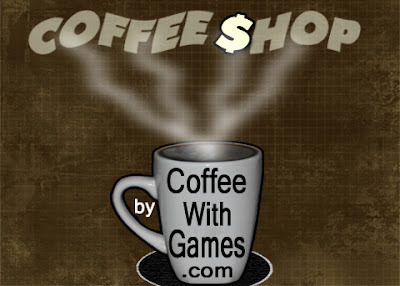 ", and with March starting up, CoffeeWithGames should get back to a regular posting schedule of a couple of posts each week. March is upon us, and with it new games (and maybe coffees) are waiting in the wings, but what coffees did I consume and games did I play in February? Brew yourself a nice pot of coffee, and let's take a look! Maxwell House returned in February as our default coffees of choice, but there were a few more that were brewed up during the month. The default Maxwell House coffees we brewed up were the Maxwell House French Roast and the Maxwell House Dark Roast. We still have some of the Maxwell House Dark Roast, and it has gotten March started off well for us, but the French Roast was finished earlier in February. Both the French Roast and Dark Roast are very similar in flavor, neither has a strong bitter flavor, but each provides a nice bold flavor. 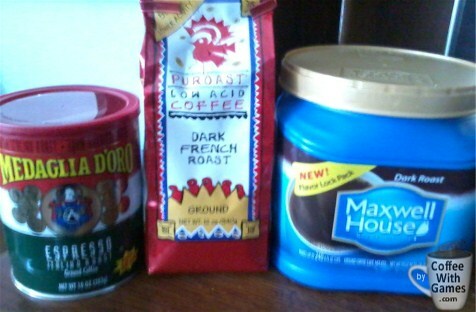 Between brewing the Maxwell House coffees, we enjoyed several other coffee blends in February. One of those blends was the Kona Blend Coffee, which was/is sealed up in the cabinet and used occasionally. It's a a whole bean coffee, that I actually received it last year for my birthday, and I'll grind up some of the beans when we're running low on the Maxwell House, or if we run out. It's more of a mild roast coffee, but is a good backup coffee to have hidden away. Another coffee blend brewed up in February was a new one that we had never tried before. It was the Puroast Low Acid Coffee, Dark French Roast blend. The idea behind this coffee is that it provides a great tasting coffee, but has a 50% lower acidity than other coffees. The verdict? To me, and Mrs. Coffee, this coffee seems to be missing the "bite" that makes coffee, well, coffee. While our blend was the "Dark French Roast", which is supposed to be one of the strongest coffee roasts, it had a very light flavor. It actually reminded me of the Starbucks Blonde Veranda Blend we have brewed in the past, which I called "an extremely light blend". If you like lighter tasting coffees, then I would recommend giving the Puroast Dark French Roast blend a try, but you should know that it probably won't taste like your typical French Roast coffee you have had before. The last, new, coffee blend we brewed in February was Medaglia D'Oro Caffé Espresso roast. It's definitely a stronger blend, as you would probably expect with "Espresso" in its name. I enjoy it, and Mrs. Coffee makes sure to sweeten her's up, but it is definitely has the "bite" that I expect from darker roast coffees. The quick, "Instant Coffee", list of games I played in February is: World of Goo, The Legend of Zelda: A Link to the Past, Mutant Mudds, Balloon Fight, Call of Duty: Black Ops II, and Trine 2. Bean 1's stats from a World of Goo level. World of Goo - I made it through the first four worlds and when I get to the last level I'm not sure what exactly I'm doing in it. Bean 1, in typical fashion, deletes the save files quit often, so I have played through several of the levels many times. Bean 1 beats levels on his own, quit often, and even just completed a level from the World of Goo WiiWare demo we have. The Legend of Zelda: A Link to the Past - We are continuing to make slow progress in the game, if the save file can last more than a few days before getting erased! Bean 1 still plays this, and runs around pretty well in the game and even knows how to switch between inventory items now, and I'm always amazed when he beats random enemies running around. Perhaps once Bean 1 is out of his erasing save files mood, we can beat the game. Until then, we'll probably just keep playing randomly and having fun. Mutant Mudds - Has Mutant Mudds Deluxe released for the Wii U yet? I didn't think so! Bean 1 still opens this up randomly on the PC, and will play through different levels. I, of course, will end up playing through (or attempting to) a few of the levels, with him watching what to do. My first effort in Balloon Fight. Balloon Fight - My first eShop purchase, and it cost me a whopping 30 cents. This game is part of Nintendo's Wii U Virtual Console Trial Campaign, where they are offering certain NES games for just 30 cents, for 30 days (one game, every 30 days). 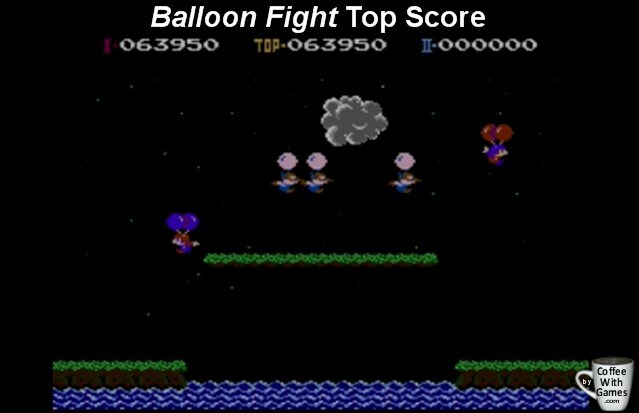 Balloon Fight is definitely simple enough and plays well, but I find the sound effects are a bit on the tinny side. I haven't made it very far in the game, but I did post my first "high score" to the Miiverse community. Was it worth the 30 cents though? Absolutely. Call of Duty: Black Ops II - Unhealthy. Unhealthy. Unhealthy. What was the cause of lack of sleep for me during February? Was it two little Beans running around, blogging late into the nights, or creating my next multi-million dollar invention (not sure where I misplaced the first)? 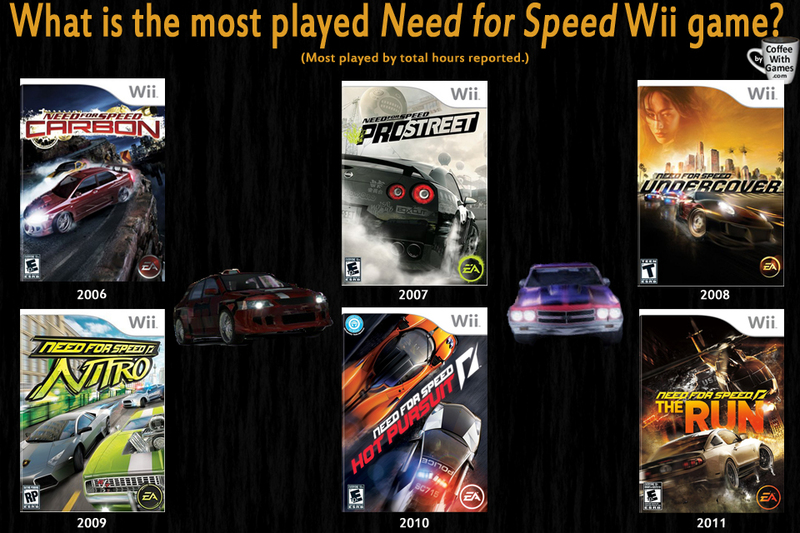 No, the lack of sleep in February was because of Black Ops II on the Wii U. After getting the Beans in bed, I would fire up the Wii U and play Black Ops II on the GamePad late into the night, usually with some random Netflix series playing in the background. If any of you own a Wii U and are playing Black Ops II often, please add my Nintendo Network ID, Coffees, to your Wii U Friend List. I'll add you back and perhaps we can play some matches of Black Ops II together. 99% of my matches are in Team Deathmatch, though this last weekend I was playing a lot of Headquarters because of the Double XP being offered in it. Trine 2 - I'm still playing back through Trine 2's levels, trying to collect all of the items and hidden objects in each level, so that I can access the last level. Trine 2 was on sale (still is in Europe) during February, down to just $14.99, and now there is a demo for the game on the Wii U's eShop as well. If you have been wondering how Trine 2 plays (and looks), definitely download the demo to give it a try. If you own Trine 2 on the Wii U, have you beaten it and unlocked the last level? With a new month upon us, I'm actually looking forward to a few games releasing later this month, though I will probably only pick up one initially. While I'm interested in LEGO City: Undercover, Monster Hunter 3 Ultimate, and Need for Speed: Most Wanted, I'll probably only be grabbing Pandora's Tower when it releases. Had Nintendo of America actually done their job during Wii's main life-time, and brought already developed games to the U.S., I probably wouldn't be diverting potential Wii U funds, to purchase a Wii game. U.S. Wii owners (and Wii U owners) can purchase Pandora's Tower later this month for just $39.99, thanks to XSEED Games. Were there any coffees you consumed in February that were new blends, or just stick with your regular blend(s)? Did you play any games in February that you found particularly addicting, like I did Black Ops II, and are there any games you are looking forward to that are releasing in March?